I know we should do everything we can to encourage healthy eating, but spending money on a unitasking kitchen tool designed to prep a banana is just completely unnecessary. Mother Nature's most perfect food doesn't need our help. What's that you say? 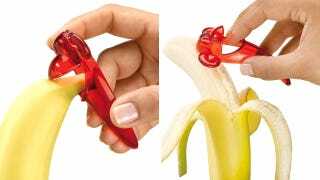 It makes peeling a banana easier for little kids? I'm pretty sure anyone young enough to struggle with that procedure had the banana handed to them by an adult who could do it for them. They didn't shimmy up a tree and pick it themselves, so I don't see the problem there.